We may have not chosen to withdraw to this desert in our life of chronic illness, but it is still a place we can go for a walkabout with the Lord. Kerryn explains. There are many references to Jesus disappearing to pray in lonely places, the wilderness, or the desert. Often those words interchange in different translations. Being an Aussie I really relate to these desert places. Our family has done much traveling through our country and driven through some very remote places. We know the toll that weather, loneliness, and unpreparedness has had on many tourists that travel through our deserts. It is not a place to be taken lightly, as it strips people to their core. The first people in our nation, the aborigines, thrived in our deserts with life skills taught through generations to survive the harshness. Many went through an initiation that involved “going walkabout” on their own to embrace the lessons of the land to survive. Often times our illnesses feel like we’re “going walkabout”–being initiated in our own desert of loneliness, harshness, and dryness. Isn’t it interesting that Jesus chose the desert to go to pray and spend time with His Father? He chose the remote places. Maybe part of that was to relate to the Israelites, who spent 40 years roaming the desert. Surely it relates to all of us, who experience a desert of some sort. It may be a lack of health, family, friendships, finances, or comforts. Yet, this is where Jesus regularly sought time with His Father. Here I am in my own little desert. I haven’t chosen it, yet if it’s where Jesus chose to commune most closely with His Father, it’s good enough for me too! What an opportunity to commune with God, just as Jesus did. Will I take this opportunity to grasp this desert time, this “going walkabout” to grow what He’s given me? not only to survive, but to thrive? Prayer: Lord, I often feel like I’m in a desert… lonely, dry, and desperate for You. Help me to see that the desert is exactly where Jesus chose to be with You. Thank You for this opportunity to commune with You and to grow. Amen. How does the desert relate to your experiences now? How can this facilitate a more precious prayer life with your Father, as Jesus had? Filed Under: Devotionals, Overwhelmed, What's New? Great devotion Kerryn 🙂 Our afflictions certainly are their own sort of desert. This message stuck me, not because of my own illness, but because of my son’s mental illness. Raising a child with MI can be so lonely. Only someone walking that desert journey can understand what it’s like. Because of the stigma that surrounds the illness, most moms don’t talk about it. Their hesitancy to reach out compounds the loneliness. Deep sorrow and anguish fill the isolation. So I love the picture you painted with your words. I can imagine Christ joining me on my walkabout. 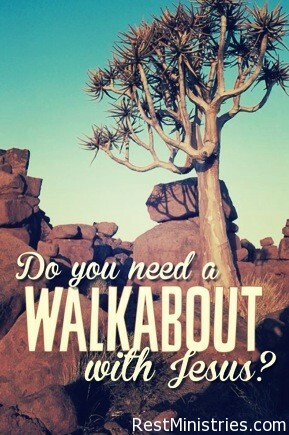 Your message led me to find out more about “going walkabout.” Songlines intrigued me. Surely my Creator leaves marks along my path of life. Singing worship songs during my journey will help me be alert to signs of His leading. It often seems that desert times are the times we realise most clearly that we cannot do this alone and only by drawing on God’s strength can we continue – which is kind of ironic in that those times are also when we may take the time to draw closer to God. Maybe that’s just the way God knows will be best for us. Sometimes I think that illness/pain and other desert experiences are a gift (not always!) but because of them, we do lean into God and appreciate our need of Him so much more. Thanks for reminding me of so many beautiful places in our Country! I find this uplifting. Your words also. heir future survival would depend on how well they went through this. voice. I pray we will all take advantage of this privilege in the middle of our pain, etc. This gives us a closer bonding and learning experience that we could have nowhere else. Deni, hi! Do you remember me from the study of “HInds’ Feet in High Places”? “Much Afraid” also had her desert experience didn’t she. Blessings to you just where you right now. So interesting to see the term walkabout in this article. I have used my own term walk about as two words. I use it a lot so I see a kindred spirit now. I too have been placed in the position of aloneness and lots of isolation with various treatments that strip my immune system. I was divorced because I was married to a man who didn’t get it and left me to my own struggles alone. My children are off conquering the world. Then, then, I had the solitude and the resources to hit the Word full force. As I look back, I think of the lessons I have gained in the last 13 years and I am astounded. I look at the miracles and blessings the Lord has brought my way and I am astounded, truly astounded. As I am able to spend a day digging treasures from the Word, I know that I am privileged. I am in a lot of pain and always fatigued no matter what I do but it will not stop me from the Word. I have times of disturbed sleep but I am blessed with 3 Christian cable channels and some of the very best teachings are aired at that time of the night. Sometimes I know God has awakened me so I won’t miss that show. Yes, yes! This is a privilege and a blessing. Kerryn so enjoyed taking a walkabout with you today as I read your devotional. I was given not only an inside view of your life and culture in Australia but also a clear and intriguing view of my Lird as He lived and was our example. I’ve been keeping you in prayer since your last message (Sept. 19th)…praying that the Good Shepherd who leads us beside still waters will lead you to an energy oasis, to restore you. Energy remains minimal, so comments remaining short. Loved this devotional – as I sooth my body with cushions and wheat bags I remember I can still spend time with Jesus and intercede for revival in Aus.I’ve had a bad time with winter viruses which have left me bedridden, although I’m improving now. The hours I work are short, but I’m wondering whether I need to retire next year. Praying that my son will have his first proper job by then. I remember your story of how you resigned – it’s not easy. How’s your tribe? I’m sorry I’ve not been in touch for ages.